Have you ever wished you could just pray like that person in church who prays with such authority? How about trying so hard to spend the hour per day in the word that your friend seems to be able to do? We are constantly trying to compare our walk with God with what others do. What’s worse, is that we are also constantly trying to meet the expectations of those around us. We try to please people. All around us, we are forever trying to impress others and make people think good things about us. The scary thing is that we can easily get caught in a web of confusion by trying to meet those unrealistic expectations. People’s expectations of us can quite often be performance based. They have expectations on what kind of church involvement, and volunteering there should be. A ‘good’ Christian would be a Sunday school teacher, say. Do you know how many people feel like they ‘should’ do something because of the expectations of others? Some people in our lives may assume we should follow their advice on how we should or shouldn’t have a relationship with God. They sometimes have the expectation that there are a certain type of devotions you should do in a week, or even for a specific amount of time each day! They base their knowledge on their own experience without leaving room for you to be who God designed you to be. God expects us to follow His voice, and His voice only. God said we are not defined by the works we do. I believe He expects us to use the gifts He has given to us, and apply them where needed. We need to be ok with saying no sometimes, and be sure our motivation for ministry is at the right place. Am I primarily doing it for God, or for others? God sent us the Holy Spirit to guide us in our daily lives. God is not limited by the kind of devotions we do, how many days a week or how long each day. God... I believe He wants our best effort as far as getting into the bible, etc., but remember, it’s not about the expectations of others. Ask God to speak to you about what He expects of you each day. Just in case some of you are thinking I’m making a blanket statement… I am not saying that God doesn’t use people in our lives to teach us and show us about having a closer walk with Him. He sure does. But we need to be extremely careful that we are living by God’s standards for ourselves, instead of trying to win the favour of others. They may very well have the best of intentions, however what God expects of them will not be the same as what He expects of you. 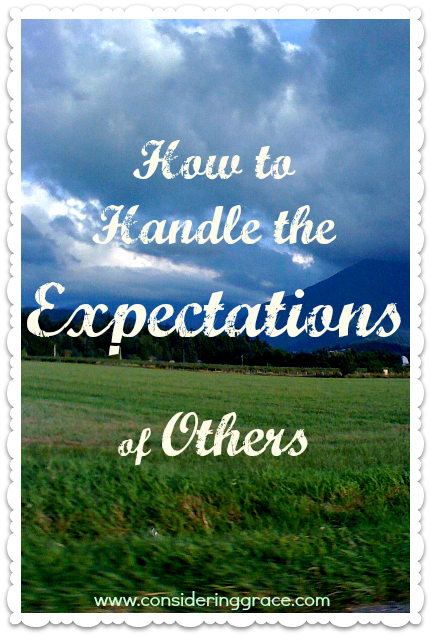 What have others expected of you in terms of your walk with the Lord? Compare that to what you feel God is saying to you. Is it the same? Ask God to help you hear His voice, and His alone.